The three of us performed personal performance art pieces. Dale performed his “Thunderthighs” piece at galleries and clubs in New York and Philadelphia. Mallory performed as a character called “Eva Stevens” in some of her solo performances. I performed solo material at New York’s Pyramid Club incorporating slide projections and sets. 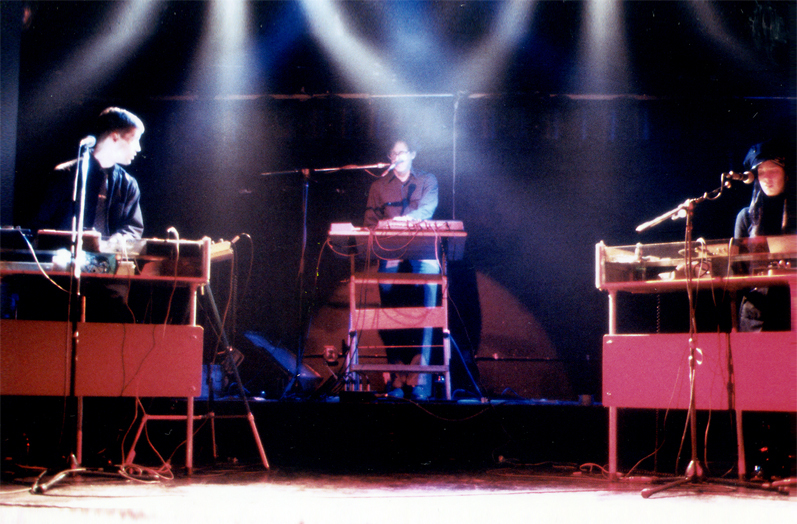 The performance art aspect of the band evolved as an approach to playing live shows. There were certain songs like “Bumpster,” for example, that really called for more of a performance than just playing the song on the instruments. The song had to do with pent-up frustrations. With a manic beat on a single snare drum, “Bumpster” was the opening number in a lot of our early shows. We would use props at times for certain songs, for example, the song “Beat Filter,” which was another song for the early shows, we wore welding masks as a way to depict the lyrics and content. For the song “Kitchen Motors,” we used a vintage mixer on stage at times, along with a power drill, which was used for its sounds. Just by the nature of the songs and music we were writing, the aspect of performance was always on our minds. How did performance art add to the creation of your music and the development of your sound? What are some instances in which you incorporated performative gestures into your music? When CCIS began, each song seemed to depict a scene, character, or situation, so the possibility of how to perform the songs was on our minds at their inception. When the songs started to take on more of an aggressive sound, the performance of the song incorporated that. When we wrote “Factory Forehead,” from the EP Signals From Pier Thirteen, it was a conceived as a depiction of the sounds of an exploding factory, so with that as the song’s situation it called for a more dramatic performance of the song. The song “No More Hollow Doors” from the album Near Marineland, was based on a dream I had of being a stowaway. The music has a heightened, paranoid feel to it and the performance reflects that. In the more recent performances of that song we have added some special lighting effects to visually depict the song on stage. You’re distinct for your inclusion of toy instruments in your music. Why did you decide to include toys in your music? What types of toys were chosen over others? Were the choices born out of aesthetic or symbolic reasons? In the beginning of Crash Course in Science, as well as for my early personal tapes, the use of toy instruments grew more or less out of necessity. A lot can happen depending on how an instrument is recorded. The instrument can sound or appear to be something else. In my own tapes, I experimented with this concept quite a bit, using a toy drum set, a toy piano, toy keyboards, and an acoustic guitar, but making recordings in one’s bedroom is very different than playing live. With CCIS we wanted to be able to perform the songs in a live setting. So we began to use the toy instruments in such a way that their sounds would dramatically project because they were amplified, using a microphone, or by plugging them directly into amplifiers. In the beginning, we had several toy keyboards and a toy synthesizer, which we still have, and use occasionally. At that time we also used a real drum set, an electric guitar, and a very inexpensive rhythm machine. Whenever we would see a toy that looked like it had potential, we would try to buy it and test it out. The toys were less expensive than real instruments, so there was that appeal as well. We tested out a lot of toys, some worked out well and some did not. Can you go into specifics about more of the homemade gear made to create your music? Why did you feel it was important to create rather than just rely on standard instruments? After using the store-bought toy instruments for a while we wanted them to be more versatile, so Dale began to alter them so they would make additional sounds. It’s something that’s known now as “circuit bending”, but back then, it wasn’t really done that often to the best of our knowledge. This opened the door for using the shell of a toy keyboard as a base, and putting a homemade synthesizer inside of it. Dale built all the original homemade synthesizers we used and continue to use currently. They each have a different color housing and we refer to them by their corresponding colors, “the orange,” ”the blue,” “the gray,” “the white,” and so forth. The progression to bent instrumentation was a natural one for us. Those types of sounds represent our most direct feelings. When we tried to incorporate standard synthesizers into our music they ended up being used more peripherally, if at all. How long did it take you to create your videos, specifically the one for “Cardboard Lamb?” What was the idea behind that video? The “Cardboard Lamb” music video was a fun project for us. We brainstormed some ideas and made a storyboard. We shot a storyboard in photographic slides of the different scenes and then projected the slides in sequence and made some revisions to the order of things until we had things they way we wanted. We worked on the storyboard for a few weeks off and on but shot the video in 2 days, one day for the exterior shots and one for the composited shots. When we shot the video with a cameraman we basically knew what we wanted. The video was shot in New York City. The opening shot is the Con Ed plant smokestacks on 14th street in Manhattan. The sound and rhythm of that song suggested transportation to us so we wanted to include scenes of trains and boats along with some industrial imagery. We felt the combination of that along with an actual cardboard lamb was a nice juxtaposition. The scene with the spiking of the lamb was an idea that came out of our discussions. At the end when we erase the drawing of the lamb on the blackboard it’s as if we’re eluding that the whole idea may be better left undone, framing it as if it never happened. How do you feel about your large following in the visual arts community? We are very grateful for the following we have. It is a good feeling to know that people are interested in what we have done in the past and what we are doing currently. 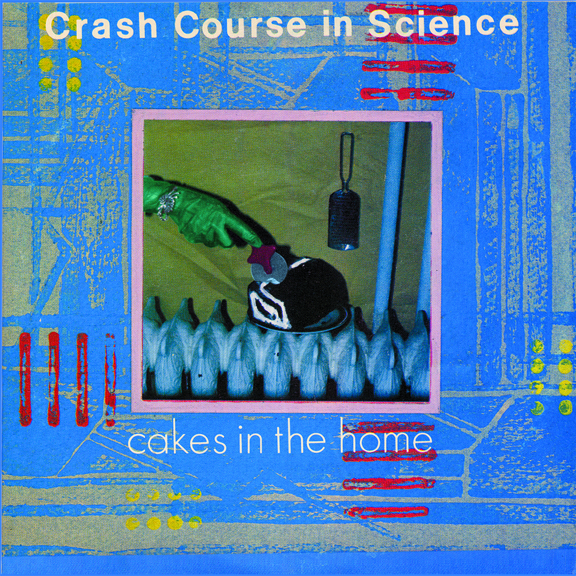 Every artist wants to have longevity with their work and it’s a thrill and a privilege to be continuing with Crash Course in Science, especially knowing that there’s an interest in what we’re doing, it’s wonderful!